It’s hard to be poker-faced when talking about Tetsuya’s. 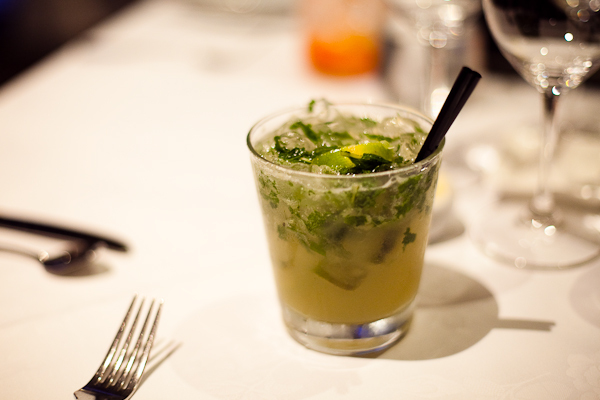 It’s the most gushed-about, overachieving restaurant in Sydney. 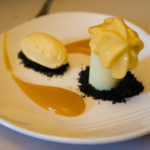 Tets has retained three chef’s hats throughout the last 17 years, regularly (almost predictably) won Best Restaurant of the Year accolades with Meryl Streep-style consistency, and claimed the title of 5th Best Restaurant In The World in 2007 (since then, it’s tumbled to a still-respectable 9th placing). You’d have to be the most unexcitable person on the planet to just matter-of-factly mention you’re going to have dinner there, all jitteriness and pitched-high expectations ironed out of your voice. I was pretty keyed up about going there, I have to say. Friends have rushed me with rave reviews of their times there, but the opinion that strikes me the most – and makes me laugh the most – is this one: Chris’ workmate claimed that the food at Tets was so good, it actually made him cry. But onto the food. 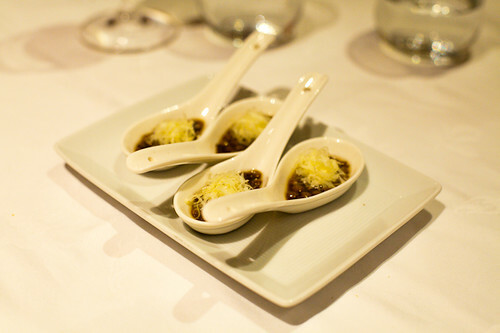 Before the start of the 13-course degustation, we were served hot mounds of bread. Having regrettably overdosed on bread on previous tasting menu occasions, I held back, rationing my roll like it was really the only thing I was being fed that night. I held strong on that front for about 40 seconds, until the others told me that I had to try the truffle butter that went with the sourdough. I loved slathering the butter onto the roll. I knew the spread was doubling as product placement (it’s made from Tetsuya’s Black Truffle Salsa, which Tabs kindly bought me as a housewarming present one year), but I couldn’t help but be totally suckered in. Most of the time, butter dishes at restaurants end up half-smooshed and unnoticed, but here, we went through three dishes of truffle butter. With our blur of knives, we meticulously wiped away every butter smear from the dish – only to have it replaced in milliseconds by the wait staff. It was uncanny how onto it they were. So, our amuse-bouche was the Cold Corn Soup with Saffron & Vanilla Ice Cream. It was incredible – and impossible to describe without sounding like a goofball. As we kept saying, it was literally, the corniest thing we had tasted. Like someone had maxed out the flavour of corn, liquified it and tipped it into a martini glass. There were probably trace amounts of saffron in it, but I couldn’t tell; saffron is such a stupendously expensive ingredient (it literally is sold in threads), so whenever I use it in a dish, I can barely detect it. Maybe saffron’s invisible taste has more to do with my invisible wallet than my lazy tastebuds. Then our table split into Vegetarian and Not-So-Vegetarian Degustation camps, so by default, you’re stuck with my vego account of the night. Sorry guys. 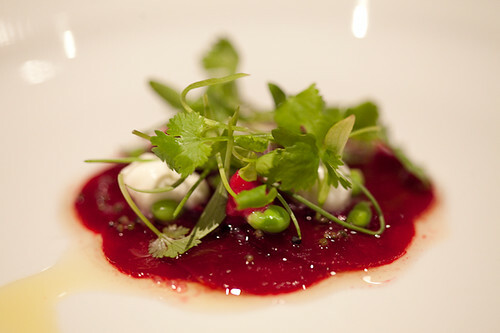 Our first dish was Carpaccio of Beetroot with Lime & Goat’s Curd. Uh-oh. Beetroot and goat’s curd-anything is like the “I have no idea! Help!” dish that most chefs serve vegos. It’s the 2000s equivalent of the 1990s vegie stack. Nathan said getting it this early on was a bad sign. It certainly wasn’t as incredible as the Beetroot Various Ways at Rockpool, but it was OK. The thin beet discs were a palate-freshener, I guess. Next came out a dish with just a flat small bamboo mat on it. We wondered if that was it? Did we chew it? Was it some Zen dish of nothingness? Or was it the first part of a whole dish – something we would have to put together like an Ikea furniture package? As the remaining parts were jumbled together, it turned out the mat was presentation-only (although we were told people had tried to eat it in the past). On it was placed a cup of Steamed Tofu with Soy & Mirin Jelly – a dish that split the table. Tabitha hated it, but I liked the subtle, soy milk frothiness. It reminded me of childhood, eating steamed tofu. The miso-salty, gelatinous sliver of mirin at the top gave it some savoury punch. Following this was a three-parter (that was nowhere near as attention-straining as Lord of The Rings trilogy): Rocket & Walnut Salad; Confit of Potato and Field Mushroom; and Cured Daikon with Cucumber. The salad was one of those “shrug/we didn’t really try” moments of kitchen resignation, but the flavour-intense square of potato and field mushroom was excellent. Juicy, savoury and unashamedly oozing in fatty goodness, it was a perfect, small dose of tastiness. The cured daikon and cucumber was tart and zippy – a feisty Japanese counter-attack to the French trick of turning vegetables into delicious grease. Tabitha and Will were vocal fans of the Tetsuya’s Cauliflower Pasta with Egg & Perigord Truffle, fast-catapulting it to the top of their Best Dish So Far list. I found it too understated to make an impact, but was impressed by the presentation. 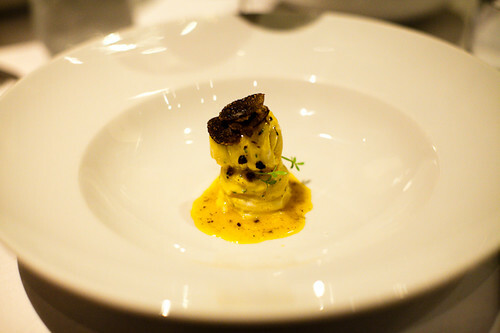 The strands were sculpted together into a helical twist of elegant spaghetti, with a truffle shaving balanced on top. As soon as you dug your fork into this pasta pillar, it dissolved into stringy collapse. It made me realise that it was someone’s job to painstakingly mould these statuesque towers of spaghetti together, for that effect of pretty disintegration. Lordy. The effort! This also came with a Seasonal Green Salad, which sounds boring, but was a “thank god!” dish for me. So often degustations become a rich food overdose and all you want is a bit of lettuce leaf just to balance all that confit and over-oiled intensity. So, Mum-like nutritional applause from me, just for this common-sense addition. The Buckwheat Risotto had an inviting crisp-fried smell that lingered and made us love it on arrival. Risotto is another classic “no idea what to feed vegetarians” B-grade dish, but this was amazing and top-of-the-alphabet. Hard to ignore was its strong Japanese taste – like the grains had been sauteed in the tentsuyu broth that bathes crumbly agedashi tofu. Simple but beautiful. The Braised Nameko, Enoki & Chestnut Mushrooms was a nice one-two-three punch of Vitamin B12. 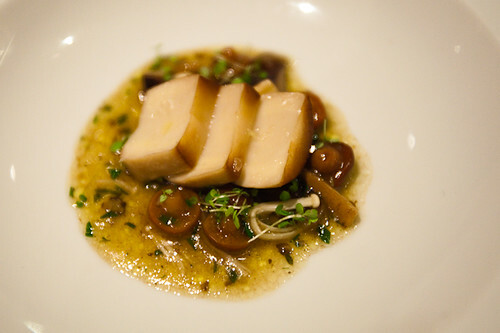 I really enjoyed this at the time, but later, felt a little sold short on discovering it was the B-team part of the normal degustation (Grilled Fillet of Barramundi with Braised Nameko, Enoki & Chestnut Mushrooms). Hm, what d’you think Blackened Onion with White Miso & Sesame would taste like? Not awesome? That’s all that needs to be said about that course. 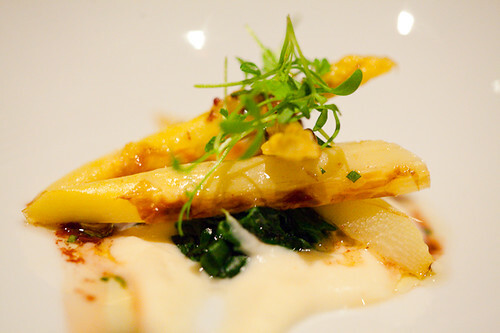 Re: Grilled White Asparagus with Celeriac Puree. Love white asparagus. 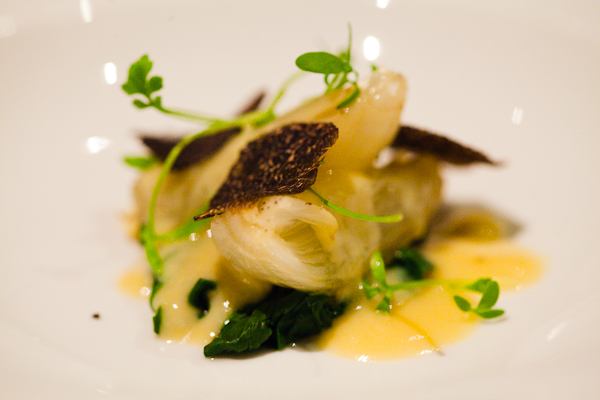 But celeriac is this weird ingredient that you only encounter in fancy restaurants and not with huge joy. A little wintry-tasting dish, this was subtle and comforting like a blanket, but nothing that would shake your life up. Sometimes with a tasting menu, the last few savoury dishes can trail off, but the spoonful of Heidi Gruyere with Lentils were a nice, small endnote. 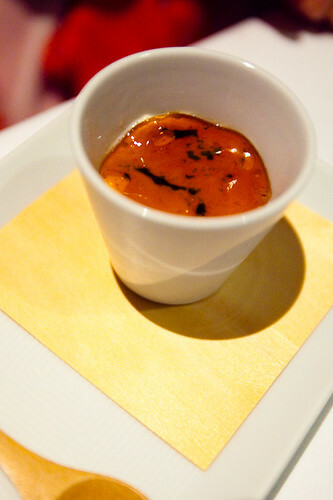 The mix of savoury lentils and the melting cheese had this rich, enveloping taste – a little like French onion soup. One mouthful was deliciously enough. 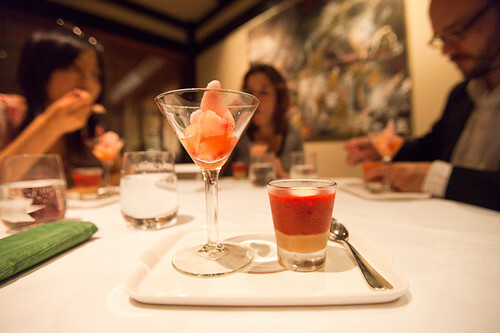 The White Peach Sorbet with Champagne Jelly with Strawberry Shortcake was a giddy head-explosion for me. “Tetsuya suggests that you mix up the shortcake,” we were told. This ‘shortcake’ wasn’t in any way baked but actually a glass with a sunset-pink band of liquid wrapped around a white creamy stripe. I instantly messed up the Rothko-like colour divisions and slurped up the intense, lush berry silkenness – and loved it. Now, just to sort-of-detour …. At the start of the degustation, I thought I was a real clever boots by not eating lots of bread. Only to later eat lots of bread. It was just that the arty, miniature portions of everything made me stupidly overconfident. By dish four I was convinced I would not get full at all that I could just keep slathering truffle butter on the sourdough roll (x2) and not pay for it (stomach-wise) later. 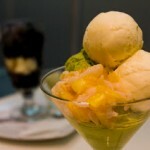 Of course, trouble began to set in as we progressed into the desserts. I was becoming uncomfortably, unmoveably stuffed. 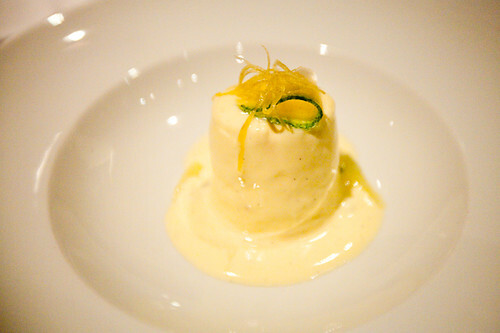 When the Lemon Scented Floating Island With Vanilla Bean Anglaise arrived, I could not handle more than a few spoonfuls. 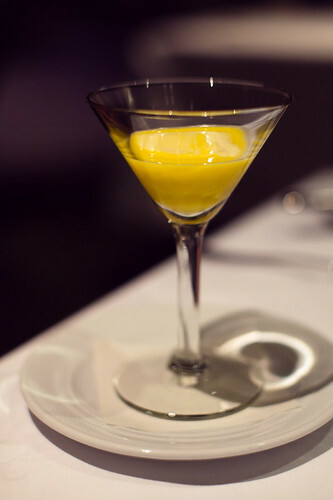 Even though it was gorgeous – the ethereal barely-there (yet-so-exquisitely-there) taste of lemon was so dreamy. And the island so soft and creamy … My inroads into it were as negligible as the polite, sand-shy flow of low-tide. After this, we got a bonus dessert! 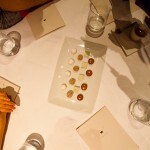 (Yes, 14 courses when everyone else cowered with a mere 13!) Explaining how we got an extra dish involves a long story that squarely presents me as a goofball though. So, I’m going to avoid that and merely say that we had an incredible waiter – Colin. He was the sort of attendant that probably retained secret superpowers – or incredible hearing, because every little niggly thought would immediately disappear on us voicing it, as Colin would resolve it before the full stop even could settle at the end of our sentences. For example, Will gave me roses at dinner’s start and as I wondered where to put them, Colin arrived out of nowhere with this small wooden booth, so I could rest the flowers next to my seat. Later, while I was totally neglecting my bouquet, he smoothly moved the roses to the coolroom, so they stayed fresh. And then he reunited me with the blooms, as I got up to leave – before I could be a Forgetful Jones and accidentally leave the flowers behind. And, here’s another example. When I thought I was being a smartypants and had still a half bread roll to go, while everyone had escalated to second-bread-roll round, I realised I had missed my chance to get sourdough #2. I grumbled that I had really timed my bread consumption badly, because the basket was not going to return a third time to our table for slowcoach me – and as I did, Colin appeared in an instant and warmly asked if I wanted another bread roll. It was that kind of service. Warm and impressively considerate (in case you’re reading the above and mistakenly getting a creepy ESP or table-stalking vibe). He was good-humoured and incredibly thoughtful, one move ahead of your whims. 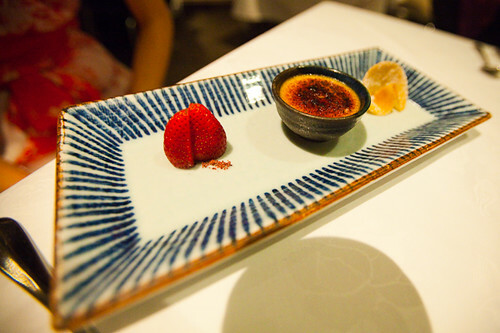 Anyway, he generously gave us an extra dessert – the Lime & Ginger Creme Brulee. I liked the crunchy-sweet “sombrero” (as I called it) and spice-dusted strawberries that came with the sweetly charred custard. As small and wonderful as this dessert was, I really battled to get in a few spoons in without feeling like I was sliding towards the dangerous, queasy level of full. This was, after all, my 13th course. 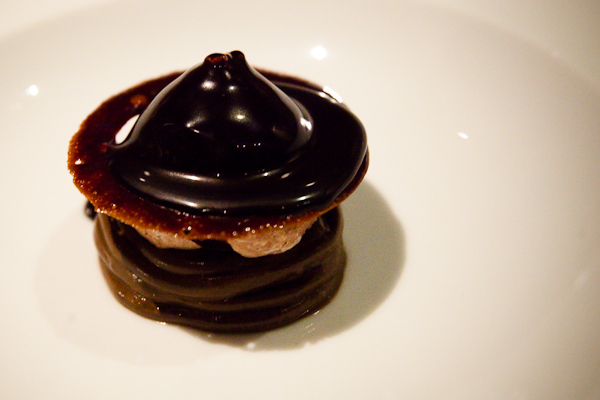 So as satiny as the Chocolate Ganache with Green Tea & Red Beans looked, I could hardly eat it. Even though it was making everyone else around the table swoony. I felt a l’il embarrassed to be wasting all this extravagant and beautifully presented food. But you can’t really smooth-talk your way out of feeling militantly full. Four hours later, we were finally settling the bill and weakly attempting to eat the Petit Fours. The green tea marshmallows were gorgeous but as tiny as they were, they added an epic kick to my already pained appetite. Nathan, incredibly, polished off enough petits fours to make up for the three of us clutching our wimpy tummies. So at the end of the night, the scorecard looked like this for me: amazing service, mostly good but not always impressive food (best restaurant in Sydney, really? ), not so fab decor (others love it, but I find it dated and too polite), cool location and entry (walk in and the gush of attention you get is pretty nice) and it definitely rates as fascinating on the people-watching front. I know many people who have had out-of-this-world food at Tetsuya’s, but my dinner there didn’t blitz away my top Sydney experiences (currently a three-way tie between Rockpool, Oscillate Wildly and Bentley.) It was lovely, not ultra amazing, but I’m still glad I went (she says, blinking as she paid). And because of all that precedes it – no matter how it turns out – you actually don’t ever forget a night at Tetsuya’s. 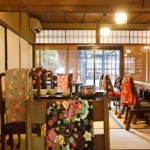 Tetsuya’s, 529 Kent St, Sydney NSW (02) 9267 2900, www.tetsuyas.com. Love your writing! 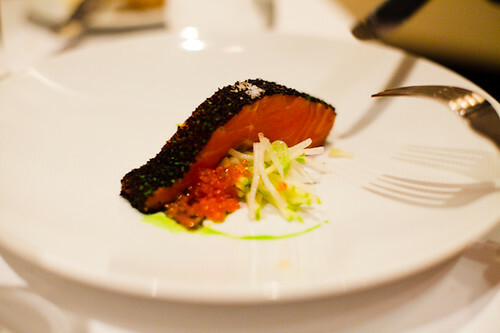 My first experience at Tetsuya’s was wonderful as it was the first degustation dining I had experienced. Since then, I have also degustated (is that a verb?!) 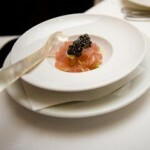 at a number of venues, including Rockpool and Bentley. I have also been back to Tets a few times and I think once your palate has been wizened, it’s hard to return to ingenue status. I would not dissuade Tets-virgins from going but nor would I rave about anything (except maybe the Truffle butter!) so that they can make up their own minds. I just found your blog, what a great post! I really want to go back to tetsuyas now! Your photos are lovely, how did you get the so light?- – did you go for lunch or do you use a flash? 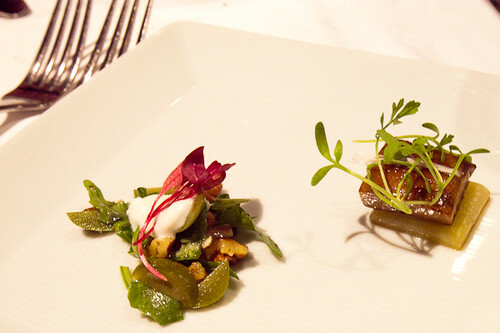 Interesting to read about the vego degustation. I wonder if it’s improved since your experience? A bit alarming that so many of the dishes were so “pedestrian” (I hate that word but it seems so fitting). The desserts look gorgeous, though. Hi Mario, I think a lot would change in the years since I’ve been (the chefs in the kitchen, for instance, would probably be a different line-up and I did see Colin, the amazing waiter who served us, working at Bistro Moncur a few years later). This was also perhaps a year or so before Tets famously “lost” its 3rd hat. Some friends went recently – they’re vegos, too – and I think they were impressed.